Disease are something that attacked life creature immune that caused by something and affect something. Every disease has their own attacked point of body part and affect differences each other. Some caused of disease for ducks are fungal, bacteria, and virus. Every disease can prevent by some actions like vaccinate injection, cleanliness or hygienic management, and healthy food management. Some of vaccinate does formulated to face virus but it doesn’t mean that disease caused of fungal or bacteria can’t prevent by vaccination. One of all duck diseases that should be known by farmer is botulism. 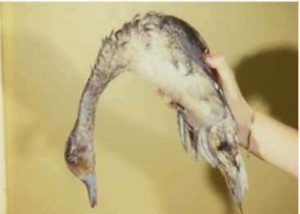 Botulism is disease that caused by bacteria that attacked duck. Botulism attacked the neural that caused paralyzing, low appetite and also died. This disease caused by rot food that ate by ducks. So, it is clearly informing the farmer to keep the cleanliness of duck’s food. This disease is freaking serious but may for beginner duck farmer that didn’t know yet about the fact, here are some facts of botulism completely. As mentioned before that this disease caused by bacteria that living and growth on duck’s food. Basically, this disease is poisoning case because they eat something rot accidentally. It can’t make sure where’s the bacteria come from but rot process can be guess easily. It is cause from wet inside the food. It may the food submerged or dropped by water without you are aware. So, it is important for you to monitoring safe point of duck food so this case can be prevented. Back to the bacteria, basically the bacteria is living in the base of the food. It wouldn’t living in the surface and it spreads out of the food. The named of bacteria is Clostridium botulinum. The bacteria are spore bacteria, rod-shaped, Gram-positive and anaerobic in nature. The spores of c. botulinum are dispersed in soil, plants, animal intestine contents of mammals, birds and fish. Under certain conditions, spores can be geminated into the vegetative cell can produce a toxin. This is the cause of c. botulinum can grow and produce a neurotoxin in anaerobic conditions such as on carcasses of animals or in the canned food. This disease mostly attacked neck, wings, and the foot of the duck. Basically, there is no limiting age of this disease. Both baby and adult duck can attack by this. This neural effect can cause paralyzing in the duck so that’s why symptom that appeared is passively move even this point is mostly can tells you every disease, not specific. For duck that raise in the poultry, feeding usually gives at the same time for all of them. By this, the food can eat by all ducks at the same time and if the bacteria inside the food is in high level, well death can come and kills them at once. Beside the power of bacteria that able to kills much ducks at the same time, transferred bacteria and spreading process would make it worse. This point will tell you how powerful this disease so you have to aware on it. This disease not only break the body of infected but also can transferred by wound and oral/inhalation of food. That’s the main media that could transferred the bacteria each other. Well every disease that attacked the duck has this symptom. Passively move not also caused by disease but also happened in female duck that ready to laying egg. So, don’t assume this point quickly before observe it more. This it the main symptom that caused by this disease. paralyzing in the foot may can caused by foot disease or difunctional. But if you find out more than one paralyzes point, it is surely botulism. Pupils dilated may can you see when the duck death but actually this is the symptom that the disease is become more serious. One of all poisoned symptoms that appeared is surely poop problem. Botulism actually same as poisoned case so when paralyzing and watery poop problem is combined, that’s surely this disease. Reminder, the poop colour is different of each duck that affected by this disease. It can be green, white, or orange. Same with the first point, hair fall may the symptom of another something that it is not automatically disease. Female duck that ready to laying egg also made this symptom. Also, the stressed duck gets this point. Every death creature is automatically pale. But pale here means different. Usually when the normal duck dead, their body getting pale without any blue on it. But when the dead duck is pale blue, that’s surely not the fresh one. This bald caused by hair fall that also caused by this disease. When you cleave their dead body, the maggots would come out as prove that there are bacteria and also because this disease caused by bacteria. As mentioned before that normal dead duck would be fresh and it can be consumed, but when the dead duck that caused by botulism is different. It surely can’t consume beside it makes blue pale and also pungent smell. That’s not totally fresh duck that allowed to be consume of course. That’s all something you need to know about botulism that attacked duck. Hopefully this information helps you a lot and increase your awareness to this disease. basically, there is no disease that can’t be prevent or healing. It is more profitable for you for preventive than survive in healing which unguaranteed yet, right?